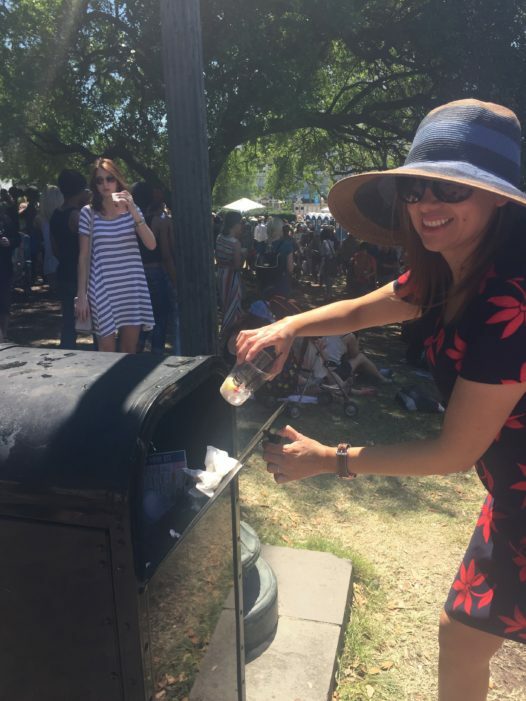 Festival goer, Elizabeth Allain, excited to throw her trash away in a can that’s not overflowing with trash (Photos by: Sarah Isabelle Prevot). 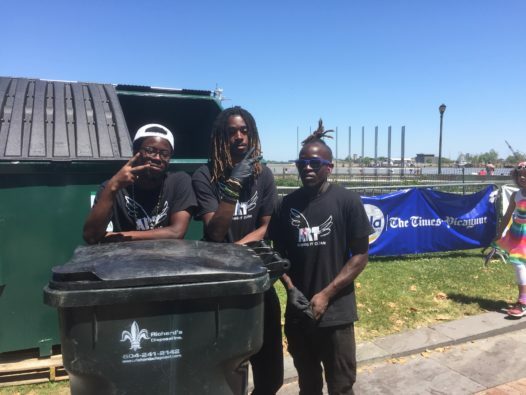 As your favorite musicians hit the stages at French Quarter Fest this year, there was a different kind of krewe hitting the festival grounds. 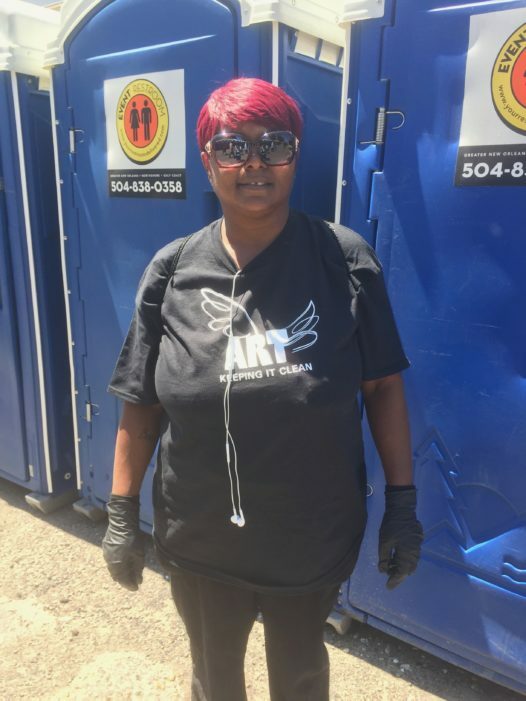 I noticed something I hadn’t before—a sharp looking group of people dressed head-to-toe in black and on each t-shirt read, “ART Keeping it Clean” framed with whimsical angel wings. They were maneuvering in and out of the crowd with such ease that no one really noticed them. They were doing something very important, though. They were cleaning up everyone else’s trash. “It’s not an easy job; it’s not a glamorous job, but we take care of our people,” states Amy Blanchard, CEO of ART Janitorial Services, LLC. Perhaps more well-known today as local TV celebrity Sidney D. Torres’, The Deed, mother, Earline Torres created ART Janitorial Services in 2008. A completely female-owned business, it has a sentimental demure that only close friends and family or extremely inquisitive folks like myself would realize how dear the company’s name is to Earline’s heart. After tragically losing her son, Anthony Randazzo “Tony” Torres, in a fatal car crash in August 2007, Earline named the company after him. I took a moment and reflected on the angel wings. “Events produce a lot of trash,” declares Amy. She calculates the 1,000 yards (roughly) they manage for the festival will produce anywhere from 300,000 to 400,000 pounds of trash by the approximately 700,000 attendees over the course of the FQF. “We have 108 regular port-o-lets, 16 ADA (Americans with Disabilities) port-o-lets, 1 port-a-lisa, and 9 hand sanitizer stations. We have 11 Eight-yard dumpsters and roll-off dumpsters too. All the cans get brought down here after the event closes and at 4 in the morning, they all get emptied and placed back for the next day,” explains Amy. I noticed how the Eight-yard dumpsters were strategically placed throughout Woldenberg Park. Painted green, it was as if they were part of the natural landscape, inconspicuously located along the grounds. “If everything was centrally located in one spot then you’d have to drag trash bags all throughout, and it wouldn’t be nearly as efficient,” Amy explains. Talking that much trash—I realized how intricate of an operation it is to keep a festival clean. “We have 26 people out here; they take pride in cleaning up,” Amy says, boasting proudly about her krewe. Trash is a funny thing—you don’t notice it until it’s a problem. In my case, though, I saw nothing but solutions when ART Janitorial Services is on the job. You can catch ART Janitorial Services throughout the year as they manage all clean-up services for the French Market.